Universal Horror Films: "Ve Bid You Velcome"
nothing spelled M-O-N-S-T-E-R-S quite like the Universal Horror movies! My world became a much bigger and better place when I was introduced to the elite group of Universal Studios horror superstars and the incredible films that featured them. These movies were serious productions that were nothing like the low budget drive-in cheapies that wallpapered lobby cards and drive-in movie marquees. Universal Horror films were exquisite, beautifully produced works that brought us the most cherished of monster celebrities, and some of the finest moments in cinema's illustrious history. The first time I ever saw The Wolfman creeping along a fog-shrouded forest floor under the eerie light of a full moon, I was terrified and filled with childish wonder at the same time. Soon the likes of "Frankenstein", "The Mummy", "Dracula" and "The Creature from the Black Lagoon" would come to be steadfast friends on our family television set, yet deadly enemies come bedtime. The makeup for each creature was astounding, and the special makeup for The Mummy alone was magical and ground-breaking. That magic was created by a man named Jack Pierce. Like me, if you were a kid growing up in the 50's and 60's, you were witness to some of the finest entertainment imaginable through the meticulous lenses of Universal Studios. 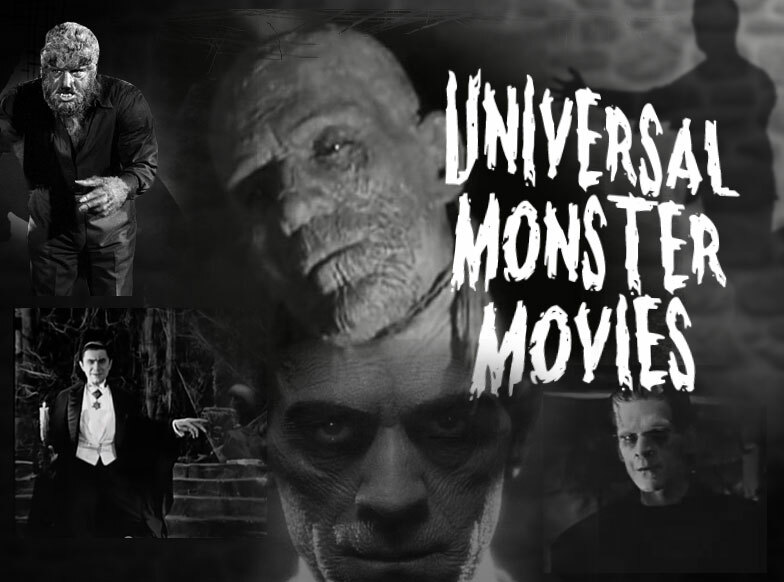 Universal's greatest monster films began in the silent era of the twenties and raged on with a catalog of unforgettable entries. 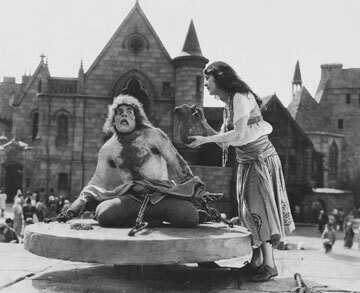 The twenties gave us the silent classics such as "The Phantom of the Opera" and "The Hunchback of Notre Dame." The thirties introduced "the classics" with the likes of "Frankenstein", "Dracula", "The Mummy", "The Invisible Man", and "Werewolf of London". The forties continued with a more pronounced era of monster films-still with magnificent sets and effects, but with finer production values. Indelible classics like "The Wolfman", "House of Frankenstein", and the unforgettable "Abbott and Costello Meet Frankenstein" remain a proud chapter of Universal history. Then came the glorious fifties; this was a period of American history that rejoiced with the end of World War II, and became a decade of fun. People were beginning to unwind and enjoy life once again in a post-war America. 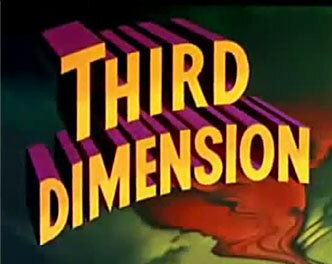 Universal horror films joined in the fun, and offered something new: 3-D. 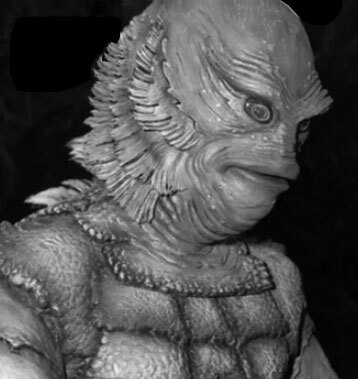 Features like "The Creature of the Black Lagoon", and the unforgettable sci-fi classics "It Came from Outer Space" and "This Island Earth" had a unique flavor with an extra-dimensional look. Universal Studios did cash in on the drive-in fare, and although the production values weren't as strong, the movies were still a far cry over the competing American International Pictures. Universal Monster classics such as "The Mole People", "Tarantula", "The Deadly Mantis" , and "The Monolith Monsters" were great movies. Medical science advanced leaps and bounds thanks to grave robbing. The opening scenes of this movie were terrifying to me when I first saw it. The gallows, the creepy graveyard, and the hunchbacked brain-stealing assistant of the Baron Frankenstein were among the greatest horror scenes I can recall. They still are. This was one of the most atmospheric movies in horror history, and to this day I'm still amazed by the quality of the set designs. Like Dracula's castle, Dr. Frankenstein's laboratory is utterly astounding. The remarkable flourishes with these oldies is mind-boggling considering the technology of the period was dependent on art direction and brilliant set design. Boris Karloff's magnificent portrayal of the electro-charged monster is still incredible. The creature, with all the instincts and wonder of a newborn, stumbles his way into the film and dominates every scene where he is featured. Karloff's uncanny abilities to act and project were astounding (hence his stage name "Karloff the Uncanny"). Though Karloff wasn't a tall man, he presented like a pro, and made us believe he was a giant creature who looked ten-feet tall. Boris Karloff was a master craftsman. A friendly greeting with sinister intent introduces us to the infamous Count Dracula, forever personalized, characterized, and basically re-invented for celluloid by Bela Lugosi. 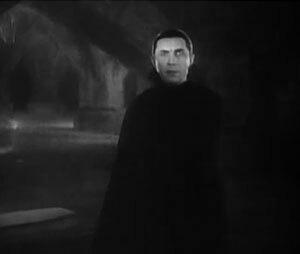 Lugosi took ownership of the role and turned Dracula into a world icon. The performance is indeed dated, but at times, incredibly chilling. I first saw this movie in second grade, and his effect on me was priceless. I was forever taunted by my dark bedroom, and any type of long flowing garment-namely a bathrobe hanging on the door. Again, lavish sets and atmospheric photography literally painted this masterpiece in a dreary palette of blacks and grays. Half of what makes this film so frightening were the wide shots and the overwhelming sense of grandeur of the castle. You'll want to sweep the cobwebs away as you tour this evil edifice. The castle is huge, yet there's nowhere to hide from the Count. Renfield, played by Dwight Frye, was perfect as Dracula's lunatic assistant on a bug diet. At times it's a bit overplayed, and Dracula becomes something of a caricature, but I cannot deny the expertise of the production overall, and again, those magnificent sets! In my opinion, this is the most dazzling movie Universal released in their run of 30's horror entries. The exceptional makeup, sets, and the allure of Egypt, all had me spellbound as a kid. Nothing has changed over the years, and I'm still fascinated with each viewing. There was no need to remake this movie, it was already perfect. 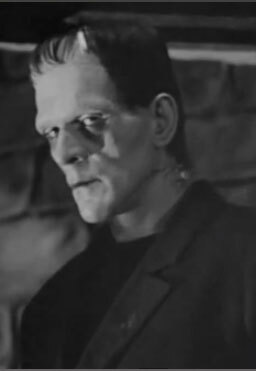 "Pierce began transforming Karloff at 11 a.m., applying cotton, collodion and spirit gum to his face; clay to his hair; and wrapping him in linen bandages treated with acid and burnt in an oven, finishing the job at 7 p.m. Karloff finished his scenes at 2 a.m., and another two hours were spent removing the make-up. 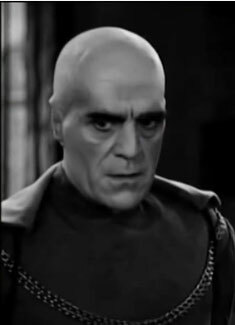 Karloff found the removal of gum from his face painful, and overall found the day "the most trying ordeal I [had] ever endured"
Years later, Imhotep returns posing as modern day Egyptian Ardath Bey. Bey shows up just in time to point the archaeologists in the right direction for their dig. Karloff was again hypnotic and terrifying. 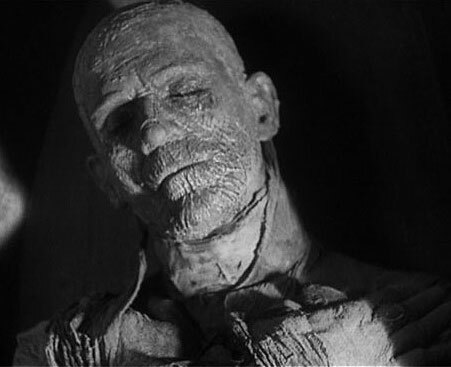 The mummification scene still packs quite a wallop, and is one of the most frightening scenes in movie history. The Mummy is an incredible movie hands down. "Okay, how'd they do this anyway?!" Welcome to the wonderful world of the matte background process. 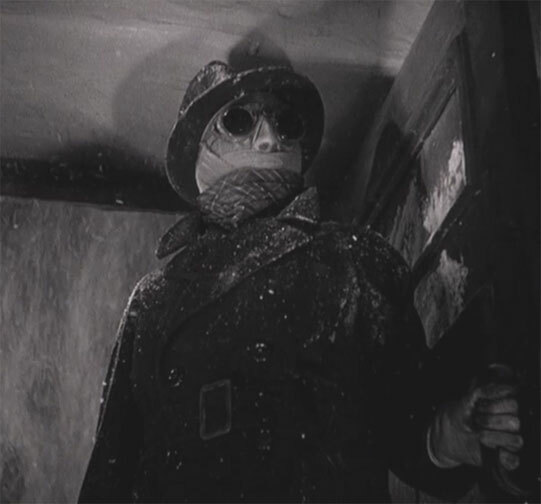 The "invisibility" effect was done by shooting Claude Rains in a completely black velvet suit against a black velvet background. On film, nothing would be seen except head and hands. These shots are then combined with other shots of the location using a matte process. This technique would be perfected by Douglas Trumbull many years down the road with 1967's "2001" A Space Odyssey" and again by Trumbull in the 1977 film "Close Encounters of the Third Kind". But aside from the then jaw-dropping effects, what makes this movie a true gem is the wild--albeit invisible--performance from Claude Rains as the mentally disintegrating scientist Jack Griffin. My favorite scene is at the very beginning as Griffin trudges through the snow toward the town of Iping, and the warming Inn in the distance. Suddenly, he throws open the door shocking the entirety of the Inn's clientele and interrupting a dart game. The "floor up" camera technique is one of the oldest in the book, yet worked perfectly for this single introductory shot. From this moment on, it's apparent that he is far more frightening with clothes on, than off. Soon we see him slowly descend into madness struggling to find his way back to visibility. As he does so, interruptions infuriate him, and his antics get more and more animated, exciting, and just plain hilarious. 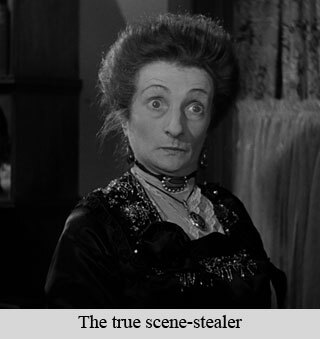 One of the finest characters in the film is the hysterical wife of the Inn keeper. What's more interesting is how Griffin's invisiblility is such a delight to witness; We see a singing pair of pants strolling down a country lane; Someone gets whacked in the head by a broom, and bank cash drawers open and money starts flying through the air. Invisibility it seems, does have its benefits, but hiding permanently was a bit harder than Griffin thought. In the end, he takes a bullet, and is revived to full visibility by a simple blood transfusion. This final scene is when we are given our first and only look at the real-in-the-flesh Jack Griffin. Though the title has little inference to the movie (except for the fact that Karloff's character carries a black cat around with him as he checks on his glass-cased victims), don't take this film lightly! I'm sure it provided plenty of nightmare material for movie-goers during its time. "The Black Cat" was Universal Studios' highest grossing film of 1934. Everyone was raving about it. This is truly a creepy movie from the bizarre sets and lighting to the ending where Boris Karloff's Hjamar Poelzig is skinned alive by his nemesis. 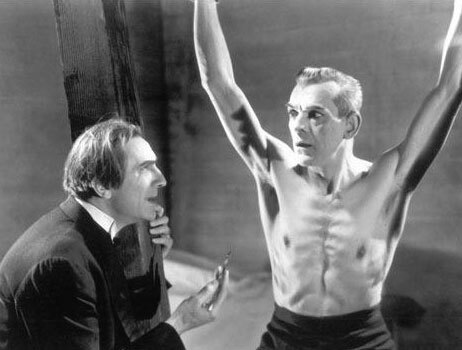 Bela Lugosi plays Vitus Werdegast who seeks revenge on his once friend Poelzig. Beethoven, Lizst, Bach, Schumann, Schubert, and Tchaikovsky's "Romeo and Juliet" all play active parts in an almost continuous soundtrack. The technique is a bit disturbing as the music is so beautiful, yet serves as the pulse for such evil. Occultism, revenge and keeping dead women locked up in glass cases are only a few of the elements that keep this movie rolling along. As dated as this film is, each scene is stark, and nearly impossible to lift one's eyes from. When I first saw it I couldn't believe how effecting it was. 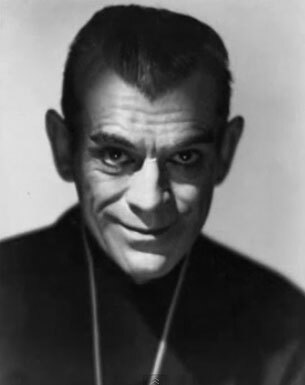 Tension builds slowly, but surely, and Karloff is beyond mesmerizing as the evil Poelzig. Necrophilia, human sacrifice, satanic rituals, and the final flaying alive scene are just pieces of the unforgettable imagery that dig deep into one's psyche and stay there. I recall the misty woodlands as The Wolfman hunched, and lurked, and moved with animal speed to snare his victims. I was terrified at the prospect of him as well as the magnificent set designs that produced the beautifully otherworldly effect of the Gyspy camp. "The Wolfman" scared me when I was young, and I could imagine him waiting for me in the closet, or breathing heavily under the bed (the preferred hiding places for monsters). This was probably one of Universal's most aesthetically pleasing movies owing to its creepy art direction. 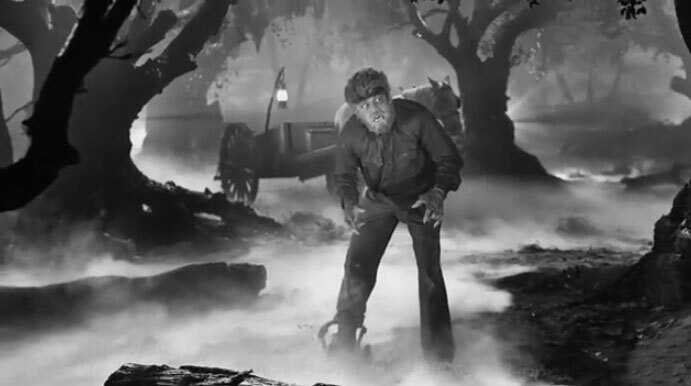 As a kid, (and looking back on the movie now), I did not find Lon Chaney Jr.'s acting to be that good; it was too over the top. But the mysterious gypsies in the mist were wonderfully added spice, and the stalking wolfman who nearly walked on cat's feet, made up for any acting inconsistencies. 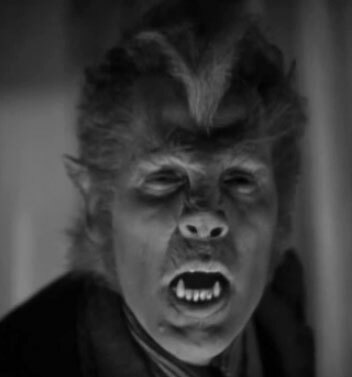 I consider "The Wolfman" to be a true monster movie by definition. It's the perfect template for horror movies to come. It took forever and a day for me to be able to see "The Phantom of the Opera", and when I finally did, I realized that it was not a horror movie at all. In my fifth grade heart of hearts, I wanted to believe that it was a monster movie, but there was no way. It's a tragic love story that had way too much singing in it, and not enough "face" time. The first version I saw was the Claude Rains version; the second was the Herbert Lom version. The Hammer Films production that starred Herbert Lom was a visual feast. The best parts were Eric's creepy under the city cavern where he abducts his true love Christine. I was in the third grade when I first bought the classic Aurora model kit that depicted a terrifying phantom with wild eyes and mouth agape. This model kit far more resembled James Cagney's "Man of a Thousand Faces" portrayal than the original Lon Chaney version. 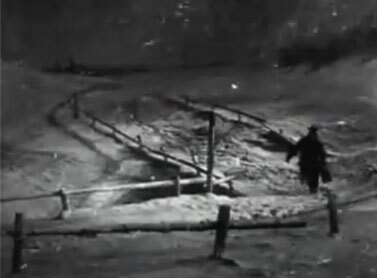 In fact, it's Cagney's Phantom in the photo at left. As a kid, the movie really did nothing for me; there was no horror, no fright, but in fact, a dump truck load of opera that only contributed to the boredom. As an adult, I find the Chaney/Rains versions to be more noteworthy and incredible films with high production values. The Hammer production was more kid-friendly, and as a kid, it's probably the version I should have seen first. "The Phantom of the Opera" becomes a horror film once we realize that it's the evil of corruption and thievery that creates the monster. Add a splash of acid in the face, and we're on our way to a great story. Again, this was not a monster movie, but hyped as such. 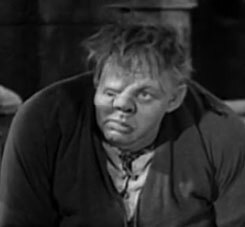 As a kid, "The Hunchback of Notre Dame" was one of the most elusive movies to appear on television, and it wasn't until 1965 when I first saw the Charles Laughton version of the film. The above photo shows the Anthony Quinn Quasimodo, a version I still have never seen, yet served as the inspiration for the magnificent box art of the Aurora model kit. Quasimodo was one of the most pitiful creatures ever, and he was neither frightening, nor evil. In fact, I found the church and the townsfolk to be the true evil in the film, and as one manipulates the other, one sad creature sees it all from the sanctity of his bell tower. The performance by Lon Chaney was probably the most intimidating, and featured a somewhat frightening Quasimodo. This is the version that appeared on the Famous Monsters of Filmland magazine cover that I had as a kid. 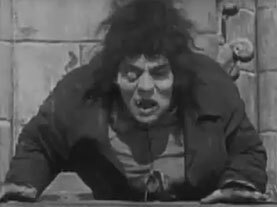 If Lon Chaney Sr. saw Quasimodo as a tortured soul, then it appeared to me that he opted to portray him as a monster. Had I seen this version the first time, it might have been more like what I expected, but the lack of audible dialogue would have bored me silly. So many versions of this classic have been filmed, but probably the finest adaptations were the Charles Laughton and Lon Chaney Sr. renderings of this timeless character. Enter the new wave of horror cinema: 3-D. Sadly, I never got to go to a 3-D movie when I was young, but have later seen them through home video with the same glasses issued in the theaters. I don't know if the effect was good in the theaters, but for home use, it was awful. It provided a blurry red and green picture that rendered a great movie unwatchable. 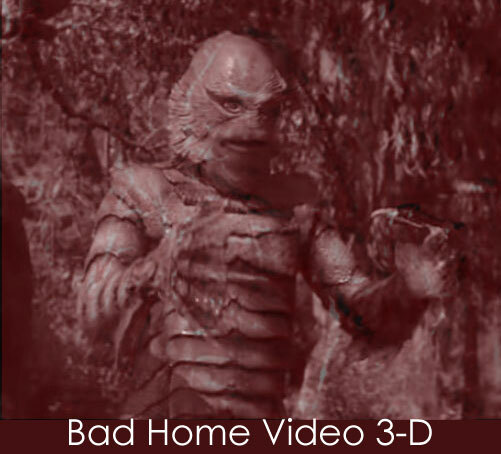 The 3-D gimmick thrilled people in the 50's, and the technique introduced us to "The Creature from the Black Lagoon". This was one of the best movies I've ever seen, and the production value is far superior to the standard drive-in classics of the era. In comparison, it feels like a major production. The Creature was frightening with its giant finned claws and towering stature. Mix in the lure and mystery of the jungle and an even creepier "black lagoon", and you've got one powerhouse of a monster movie. The innocent swimming scene underwater, with the Creature not far behind, was first-class nail biting material. However, 3-D, or not 3-D, The Creature was one of the most original, and gratifying monsters of all; he was a natural phenomenon hidden away in the jungles of South America, and had his own underwater cave where could abduct the curvy Julia Adams. He must have been a great monster indeed, for he spawned two sequels "The Revenge of the Creature" (watch for a quick role by Clint Eastwood as a teenage lab assistant) and "The Creature Walks Among Us."